The Archer House gets a new sign. See the fine print. 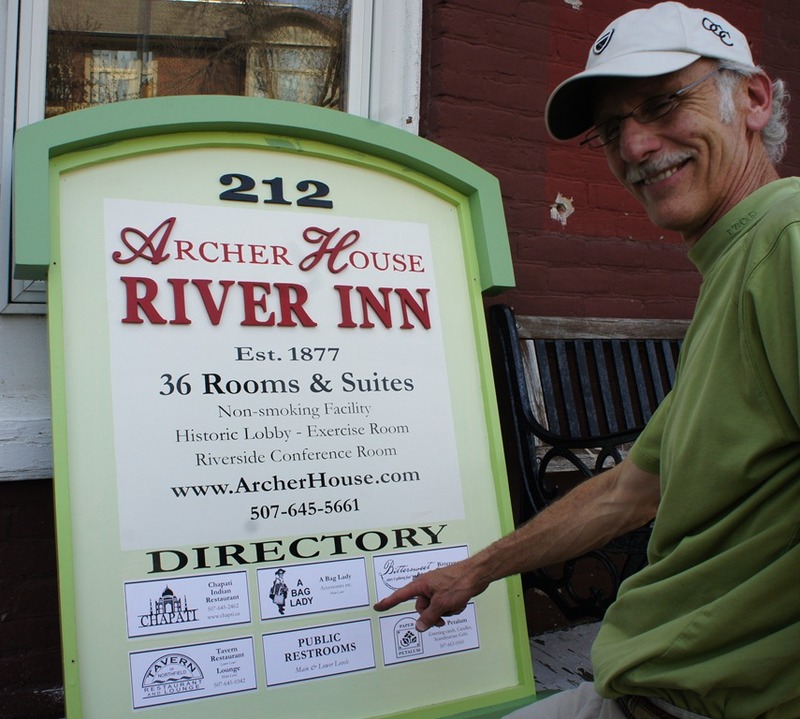 Jim Bohnhoff, Bohnhoff Design, installed a new sign on the front of the Archer House River Inn in downtown Northfield yesterday afternoon. Given that I’ve been complaining for a year about the lack of signage for the $100,000 public toilets, paid for by taxpayers, I’m happy to see it. But it sure is small. Previous PostSome N. Plum St. residents are unhappy about plans to remove trees for street reconstructionNext PostSave Our Post Office sandwich board makes its debut. Is it legal? What do you want for signage on the building? Do you want a sign that is 5 x 5?????? or a big neon sign??? They have a sign up, that is the good thing. Now the next step is changing the wayfinding signs. I will get that moving at the Streetscape Taskforce. Hayes, I guess I was hoping for something universally recognized/standard, like some of these. What are you planning for the Scriver’s Building’s exterior restroom signs? Sign? What sign? No I am just kidding. We are planning on at least one sign, maybe two. The city contract only called for 1, but we think we might be able to get another sign on the building. The sign will probably be some text and maybe the universal restroom sign. We have not thought about it that much yet. I have been just trying to get through the construction. I agree, Griff. I’ll go so far as to say I’m appalled that our “2011 Joseph Lee Heywood Distinguished Service Award” winner can’t do more than put up a nearly invisible sign to thank us for the $100K we gave him… Yes, that’s mean and snarky of me, but oh well! I am not a blogger, but the comment about Brett Reese, the 2011 Joseph Lee Heywood winner, and the small public restroom sign at the Archer House should not be in the same sentence. Brett Reese is passionate about making Northfield a better community. He donates much of his time, talent and money to the Northfield community. He is well-deserving of the Heywood Award. Mr. Reese deserves an apology for your comment. Margaret, I do appreciate your comment, but I don’t feel I need to apologize for anything – I think that somebody who is rightly deserving of this award should also have the awareness to show gratitude for the $100K they got from the city (taxpayers). In my mind, because this $ went for the restrooms, said gratitude should come in the form of a sign denoting the availability of these restrooms (which have been done for over a year). So what would be acceptable in your mind? a 5×5 sign advertising the restrooms or a big neon sign? Please elaborate on what you think would be ok. Both the Archer House and NHS are opening our buildings up to help improve the downtown by having these bathrooms for many years? We are not getting continuing support, it was a one time amount. Over the years NHS and the Archer House will spend thousands of dollars keeping these bathrooms in good order. I’m not advocating for anything tacky or horrible! It would be nice if they hung a tasteful sign from above the walkway (like some of the gift shops in the archer house do, to attract business) saying “Public Restrooms” with an arrow or something. Even that would help! I appreciate that the NHS is taking the time to investigate options for signage, and I’m really glad you’re able to make these improvements. I know upkeep is, and will forever be involved in the restrooms, but $100,000 is quite a bit of free cash to not even acknowledge the gift with a sign, in my mind. Also, I’d be willing to bet that if major renovations were required for these public restrooms, there just might be another plea for cash… Hence, gratitude would be appreciated and perhaps rewarded down the road. I’m all for supporting public restrooms – there’s definitely a need – but I’m also all for being grateful to said public for paying for them. I’m not going to disagree that maybe there could be better signage pointing out the restrooms. What I don’t understand is why it is important to point a finger at an individual who has given back so much to our community and the improvement of it. Brett Reese loves Northfield and is so deserving of this award. Have you ever ask Brett about this sign or given him your suggestions? It just seems that instead of the issues, there is always this need to attack individuals. I just don’t get it!!!! Well, I was certainly snarkier than I should have been, but it IS his building. I’m sure he’s done wonderful things for the community – I’m not disputing that – but as the recipient of so much public funds, it would be nice to have a sign that’s bigger than something you have to practically have your nose to the building to see. I don’t *really* mean to be mean – it’s not who I am. I feel pretty badly about it, to be honest. We all type stupid stuff sometimes. I was reacting to something that has bothered me for a very long time, and I should have thought it through before I typed. HOWEVER, I still think my point is valid. Part of the agreement was to put up signage, and while that agreement has been fulfilled (more than a year later) I’m exceedingly disappointed at the result. Yes we all type “stupid” stuff sometimes, I have done it many times. However, I want to make a correction to your last post. I understand your frustration with the situation, however, the sign is up and I am going to work with the City on getting the wayfinding signs updated. Then there will be little signs all over town that say there are restrooms at the Archer House. Thank, Hayes, for the correction. Thank you, also for working to update the wayfinding signs… that will help. But I still think that out of gratitude, there could have been a better effort at signage. I will definitely stand by that, even though I don’t need to be a jerk about it. Anne, If you would have been a “jerk” about it Griff would have taken your comment down. You are just being passionate about something. Anne, I agree with totally with Hayes. Thank you so much for your comments. I’ve typed things in the past as well and wish I hadn’t said them quite the way I did. Again, thank you Anne! I not sure this really makes much sense for me to jump into this frey – but since I designed, built & installed the Archer House Directory with the now ‘infamous’ Public Restrooms sign – I’ll jump in with both feet – & try hard to not say anything too foolish. I think the Public Restroom sign is just the right size – tasteful yet noticeable & just off the main entrance to the Archer House River Inn & the businesses. 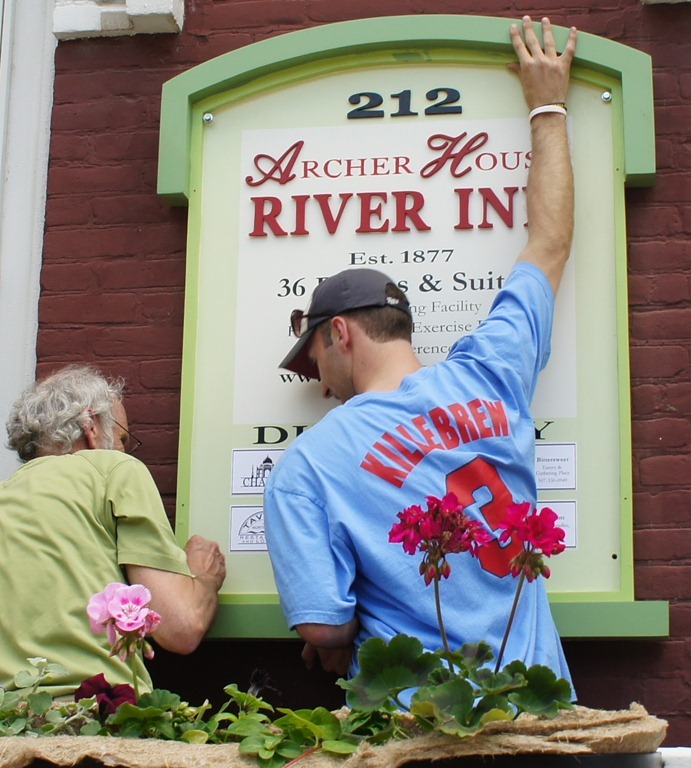 I have been in business for over 30 years in downtown Northfield and over the past two years have seen the Archer House River Inn make great strides in updating their facility. They are finishing up remodeling all 36 suites & rooms along with the lobby and adding public restrooms. The Archer House is a historic ancher for all of the downtown as well as the city. I tip my hat too Brett, Todd and the City for investing in a very important business in the heart of our beautiful downtown. Thank you.